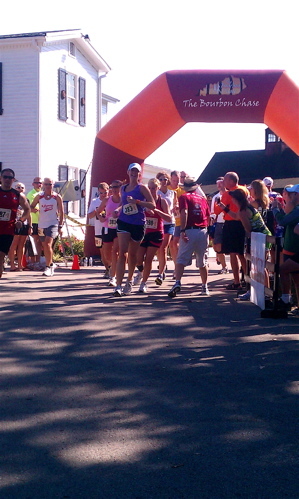 Team Give ‘Em The Bird’s first runner departs from the starting line at Jim Beam distillery. That’s the thought I had as I crested a hill approaching Wild Turkey distillery last Friday. The unmistakable aroma of whiskey wafted through the peaks and valleys of Lawrenceburg, confusing my sensibilities. Was I here for drinks or to run? It’s 9:30 a.m., and I was meeting up with the rest of team Give ‘Em The Bird for The Bourbon Chase. I knew this event was going to be painful, but wasn’t exactly sure what to expect. 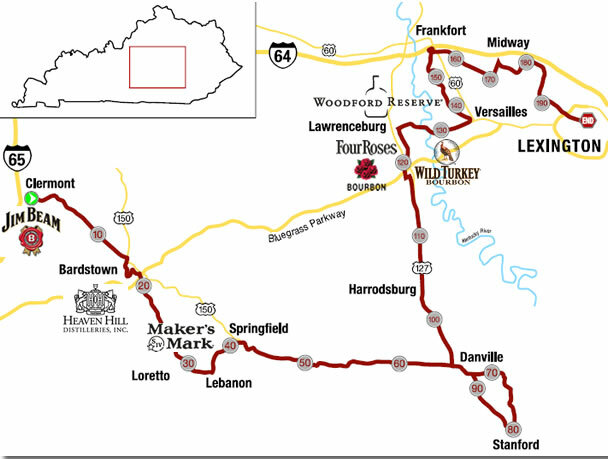 I loved the idea of combining running with Kentucky’s scenic byways, the horse farms and bourbon drinking. In preparation I’d run up to 13-miles twice, but not well. I’d been training for a half-marathon when I learned of The Bourbon Chase, but that’s an individual event. It starts at a reasonable hour of the morning and is raced from start to finish without interruption – that’s not what we’re talking about here. The Bourbon Chase takes 12 person teams and races overnight in a relay format across the 200 miles that link the six distilleries on the Kentucky Bourbon Trail tour. With 36 legs in the event, each team member runs three times, some in as few as 19 hours. This is the rub with The Bourbon Chase. It’s not the distance; the individual legs on the course average a modest 5.5 miles. It’s the repetition, hills and sleep deprivation. There’s nothing normal about running 6 miles at 3:00 a.m., especially after having run previously at 5 p.m. All the muscles in the body contract and scream to stay inside the warm van and sleep. That’s what The Bourbon Chase is all about, doing what the body tells you not to do, and while I’m still gimping around days later, it was so much fun I’m ready to sign up for next year. Mike Kuntz is the brainchild behind this event. The former Bellarmine University and U of L running coach brought together three of his passions in devising The Bourbon Chase: Running, Kentucky and bourbon. Now in its third year, the event continues to grow in popularity, rising from a cap of 150 teams two years ago, to exceeding the maximum 250 entries this year. Teams are split into two vans, with six in each. First shot of the day. Both of our vans headed to Jim Beam distillery in Clermont, where all 262 teams would begin their journey. Staggered start times were assigned each to help avoid congestion along the course. We arrived a little before noon for a 12:30 start time on October 7. White conversion vans littered the grounds around the distillery. Obviously this was the rental van of choice for teams. I hope no one else was looking for one in the tri-state area this weekend. Jim Beam had a festive atmosphere. 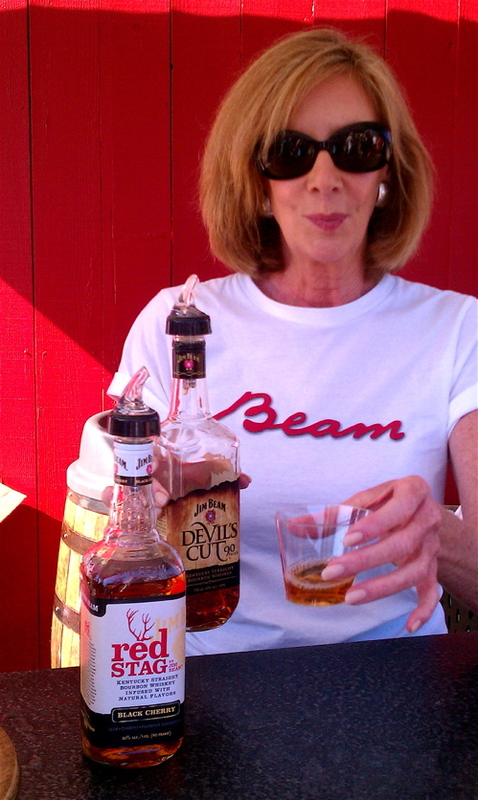 The Whiskey Bent Valley Boys were picking some hot bluegrass out in front of a brilliant red barn, and a tasting booth was set up to sample two of the label’s newest additions, Red Stag and Devils Cut. I went with the latter, figuring it was going to be a long day. A little whiskey couldn’t hurt. Being from Wild Turkey we had to represent our colors in hostile territory and the corporate boys did us proud. We had black running shirts emblazoned with “GIVE ‘EM THE BIRD,” foam turkey hats, and gobblers, that when shaken made a turkey call. Van one was up first and carried the active status. Amidst a slew of gobbler calls our first runner left right on time. A final shot of courage at Maker’s Mark. After lunch at The Old Stable in Bardstown, van two headed for Maker’s Mark in Loretto. This was the scene of the first super-exchange, where the last runner in van one would hand off to the first runner in van two, signifying the switch of our van from inactive to active. Time had moved slowly up to that point. I’d been on the road since 9:30 a.m., and it was now 5 p.m. I hadn’t even run yet. I took my last free moments to wander around Maker’s Mark, get my Kentucky Bourbon Trail passport stamped and have one last shot of whiskey, Maker’s 46. Van two was active – and what previously was a calm passage of time became one long blur of fatigue. Once a van is active it’s a sea of constant motion. We all jump out with the next runner and waited for the exchange. Once that was made, a few minutes were allotted to let whoever finished cool off, then we were hustling to the next exchange location. The Cincy Bootleggers traveling in style. It takes about five hours on average for each van to go through its six runners, but that time moves by quickly, especially as my turn approached. It was unseasonably warm on Friday, but by 8:15 p.m. darkness fell and the temperature cooled. I faced a straight 7.1-mile run down US 150 between Springfield and Perryville. The exchange was by a BP station next to the highway. I took the baton, which is a magnetic orange bracelet, then accepted a sweaty reflective vest, headlamp and rear blinking light as well, running off with them into the darkness, slowly adjusting everything onto my body before attempting longer strides. It’s funny, I had the adrenaline that usually comes at the start of a race, but once I took off there’s no one to run against – I was out there mostly alone because of the staggered start. Costumes and props were half the fun. This lucky bear was carried the whole way to the finish line. Occasionally a runner will come past but mainly I was running for my teammate who was waiting at the next exchange. I knew he was looking at my estimated time of arrival and staring into the darkness trying to see if the next shadow approaching bore any resemblance to me. I did alright on my first leg. I was just trying to keep my time steady and not get injured. It’s strange running in the dark on the open road. Around 9:30 p.m., after the super-exchange in Perryville, van two went inactive. Merchant’s Row was jumping in Perryville. Bands were playing, and food booths were open late, offering steak sandwiches, hot dogs, burgers and key lime pie shots. “Whether it is Perryville or Danville, we really try to pride ourselves on offering runners a place to come where they can have a good time, get something to eat or drink and rest up,” said Adam Johnson, executive director of the Danville and Boyle County Convention and Visitors Bureau. There’s a 10-hour window, between 6:00 p.m. and 6:00 a.m., during which vans move through Boyle County. Students took advantage of this economic opportunity at Boyle County High School and raised over $2,000 for the school’s booster program through suggested donations from runners seeking warm showers and a place to crash. 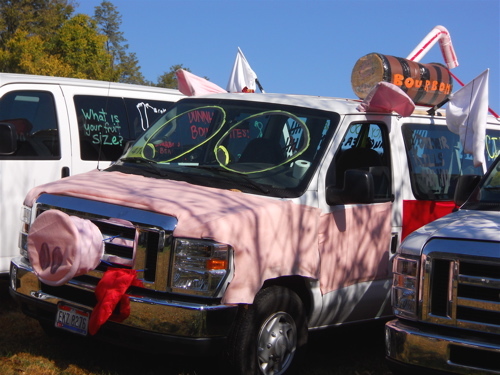 This kind of enthusiasm earned Perryville the 2011 Spirit Award from The Bourbon Chase. After checking out Merchant’s Row, we headed to Danville for the next super-exchange. There we got some pizza and sleep, but not much. By 3 a.m. van two was active again. The course description for Leg 23 read that I would be turning off the main road and onto remote country roads. I took the baton about 5:30 a.m. When I say it was dark out there, I’m talking can’t-see-my-hand-in-front-of-my-face dark. Running with a headlamp only allows for a small circle of visibility. I’d start running up a hill but couldn’t see the hill or how far it went. I had this feeling I’d left the roads. As I slowly trudged up another steep hill, I thought to myself how it wouldn’t be so bad to be eaten by a werewolf about now, so long as I don’t have to run up another hill. It was so quiet. I could hear water rushing down below, rustling in bushes, then this dog came bounding out of its yard and onto the street behind me barking. There wasn’t much I could do but keep moving forward. I was too tired. Mercifully this 5.3-mile run finally ended at a lonely Bluegrass Parkway overpass. We handed off to van one at Four Roses Distillery in the early morning fog, then headed to a crash pad in Lawrenceburg where we could shower and rest. I was leery of trying to sleep, knowing my muscles would stiffen. Besides, what was the point? We had to be moving by 10:00 a.m. anyway. “I feel like I got hit in the back by a train,” said Cameron Talley, runner eight on team Give ‘Em The Bird. The last super-exchange was at Woodford Reserve and the place was packed. It looks like a civil war battlefield. There were bodies everywhere, some face down on wet grass, others in sleeping bags or laying on tarps. Runners in The Bourbon Chase get some sleep on the ground at Woodford Reserve before the last leg of the race. It’s 11:45 a.m. when we took the exchange and the sun was coming up hot again. My final leg paralleled Interstate 64 outside Lexington, then wound its way into Masterson Station Park over a 5.2-mile course. By 2:45 p.m. I was fired up and exhausted at the same time, but resolved to deliver the baton to my teammate. The course is beautiful, full of horse farms, classic black wood fencing and low stonewalls. I tried talking to the horses but they weren’t interested. I made the handoff to our 12th runner, and van two headed for Rupp Arena in downtown Lexington. The idea was to spot our final runner coming down Main Street toward Triangle Park and for our entire team to run with him across the finish line. 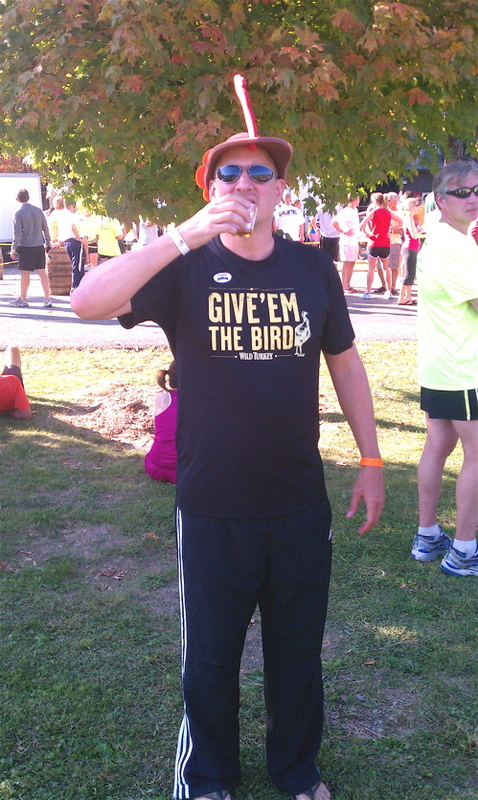 At 4:24 p.m., on Oct.8, team Give ‘Em The Bird completed the 2011 Bourbon Chase. 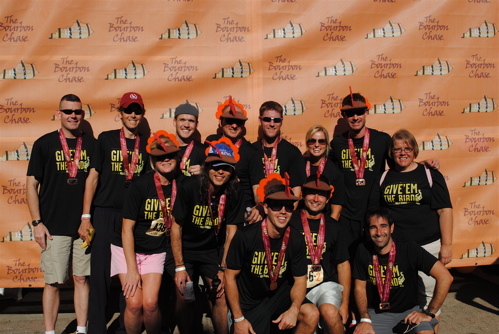 It took us 27:54:49 to cover the 200 miles, good for 62nd place. Team Give ’em the Bird: back row L to R: John Bradley, Umberto Luchini, Ben Coleman, Peter Wilson, Daniel Williams, Brittany Ziaja, Jonathan Jewell and Sheila Fint; front row L to R: Janine Coy, Will Coy, Cameron Talley, Chris Ziaja and David Gold. In the end, it all goes back to making “good time” for me. It’s about spending 28 hours in a van with guys I hardly knew and all of us supporting each other and our teammates in van one. Thankfully now we can start drinking to help mask the pain. The Kentucky Ale tastes mighty fine. With a van containing people from various parts of Kentucky, San Francisco and New York City, it was impossible to keep our team together long. Besides, more than 3,000 thirsty runners were beginning to cross the finish line – each entitled to six free shots of Kentucky’s finest native spirit. There was little time for reflective chatter, drinks were waiting upstairs in Victorian Square. Hello Wild Turkey – bring on the pain therapy. This entry was posted in Events, Exercise, Food, Liquor, News, Travel and tagged Bourbon Chase, Compari Group, Four Roses, Heaven Hill, Jim Beam, Kentucky, Kentucky Bourbon Trail, Kentucky Distillers' Association, Maker's Mark, Mike Kuntz, running, Wild Turkey, Woodford Reserve. Bookmark the permalink.